The JM Internet Group is a leading publisher of books on digital marketing. The company is announcing the 2018 edition of its popular book on search engine optimization, the SEO Fitness Workbook by Jason McDonald. We're excited to release the 2018 edition on search engine optimization, focused on small business marketing. 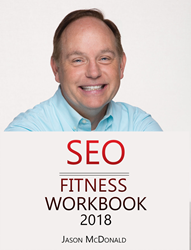 The JM Internet Group (https://www.jm-seo.org/), a leader in online SEO training, is proud to announce the publication of the 2018 edition of the SEO Fitness Workbook, one of the most popular books on search engine optimization for small businesses. To view the SEO book online, visit https://www.jm-seo.org/books/seo-fitness-workbook/. That page has both a summary of the book as well as links to both Kindle and paperback editions on Amazon.com. The book now tops five hundred reviews on Amazon with an average rating of 4.8 out of 5 stars. It should be noted that the JM Internet Group also publishes a very popular list of the best books on SEO at https://www.jm-seo.org/2015/05/best-seo-books/, which is a complete list for small business owners and marketers of the very top books on the subject. The SEO Fitness Workbook is a consistent top selling book on Amazon in the category of search engine optimization, and for good reason. First, it grows out of Jason McDonald’s popular courses at Stanford Continuing Studies, which are now taught on campus and via online. Second, the book now tops over five hundred reviews on Amazon, far more than the nearest book and many of which are five star ratings. Third, the book includes a companion toolbook of zero cost tools, worksheets for small business owners and marketers, and – new for 2018 – quizzes and action item lists. In this way, the book is a practical manual for any small business owner or marketer.